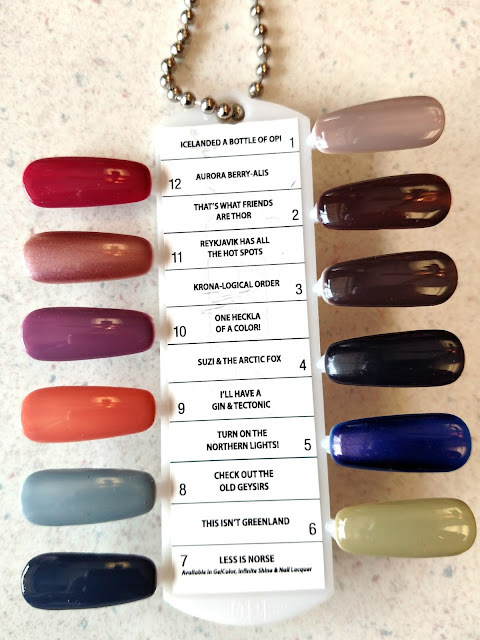 The Juicy Beauty Word: OPI Iceland Collection Fall/Winter 2017 / Does OPI test on animals? OPI Iceland Collection Fall/Winter 2017 / Does OPI test on animals? I don't even want to think about fall and winter right now, but the fashion industry is! OPI's next nail polish collection is Iceland. Interesting, because their collection themes always seem to coordinate with my client's vacation destinations. My people are right on those trends! It looks like a decent collection. Many nice colors. The names are cute and clever as usual. And, it's nice to see some rich dark browns again. The colors are available in nail lacquer and GelColor. The release date is August 1, 2017. Icelanded a Bottle of OPI is a creamy taupe. That's What Friends Are Thor is a dark chocolatey brown. Krona-logical Order is an espresso with a bit of a mauve tone. Suzi & the Arctic Fox is a deep bluish purple. I'm not so sure about This Isn't Greenland. I'm not a fan of mossy green but maybe you are. Less is Norse is a deep glossy blue. Check Out the Old Geysirs is an icy gray blue. I'll Have a Gin & Tectonic is a creamy peach. One Heckla of a Color is a dusty purple. I am loving Reykjavik Has All the Hot Spots, a shimmering gold dusty mauve. Turn On the Northern Lights! is a blue purple with an interesting pink shimmer to it the intrigues me. I'm a sucker for shimmer! Aura Berry-alis is a nice berry pink cream. I see a misspelling in this promo! OPI does not perform animal testing, nor does OPI contract to have it performed elsewhere. When “live” testing is necessary, it is performed on informed, consenting, paid human volunteers – not animals. This has always been our policy since our founding in 1981, and remains unchanged since our purchase by Coty in late 2010. Avoplex High Intensity Hand Cream -- contains Hydrolyzed Keratin from a certified BSE free source, New Zealand wool. OPI Gelcolor and Axxium Soak-Off Gels – some shades contain Carmine (INCI name: CI 75470), an insect-derived pigment. This material is also known as Cochineal. Ridge Filler – contains silk (INCI name: Serica), an insect derived fiber. Nail Lacquer -- Three (3) current shades -- Dulce de Leche, Kennebunk-port, and Tutti Fruitti Tonga -- contain Guanine (International name: CI 75170), which is derived from fish scales. These are legacy colors; there are are no plans to use guanine in future shades. Over the last several years, our trend and the general cosmetic industry trend has been to move away from most animal ingredients (beeswax excepted). Always check the label and call OPI if you are uncertain about a specific product. I'm not sure I believe it since Coty is an animal testing company and I have also read that OPI is sold in China where animal testing is required. I haven't been happy with OPI since it was sold. We do still have some colors at the salon for our die hard OPI lovers. When in doubt, use polish from a company a true non animal testing company like zoya . Click here to see the Zoya Party Girls Collection!